When Angkor Thom is directly translated, is means the “great city” in Khmer. This royal Buddhist city from the 12th Century is famed because of the grand Temple of Bayon. Aside from the Bayon Temple, it has several other sights of interest as well. Angkor Thom was initiated by Jayavarman VII, known to be Angkor’s most famous and greatest king who reigned from 1181 to 1219. He came to power after the fall of the prior Khmer capital by the Chams. During the height of his reign as king, the city had about a million people residing in the metropolis and its surrounding areas. The city was built in a nearly perfect and neat square. All of its sides were protected by a square wall called jayagiri that stood at 8 meters high and stretched to 12 kilometers in length. It was also further protected by a 100-meter moat said to contain vicious crocodiles. Today, the moat remains dry. A gate was built exactly in the middle of each wall wherein a bridge extended over the moat to reach outside the royal city. The royal palace of the city was originally built during the 10th and 11th Centuries and was made up of wood, which unfortunately is no longer seen today. Today, the area of the Angkor Thom stretches over a mile with many stone temples that can be explored. The city has 5 monumental gates that are adorned with stone elephant trunks and the then-king’s favorite motif, the four faces of Avalokiteshvara. Each of its gates is flanked with 54 gods on the left and 54 demons on the right, which was brought upon from the Hindu myth of Churning of the Milk-Ocean. The south gate remains the most popular gate and is the one that is considered best-restored. It is also the busiest one as it directly leads to the famous Angkor Wat. The east gate is especially prominent because it was used for a scene in the Hollywood Movie “Tomb Raider” starring Angelina Jolie. The most popular destination in Angkor Thom is certainly the Bayon Temple. Although a largely popular Buddhist temple, it retains elements of Hindu imagery and cosmology. It stands exactly at the center of the walled city and presents the intersection of heaven and earth. It is best known for its enigmatic happy and smiling faces of Avalokiteshvara and many of its extraordinary bas-reliefs. Another notable temple is the Baphuon temple, which was built in 1066. Today, it is in the process of being restored, which gives visitors a good idea of how these grand temples were constructed centuries ago. Another pyramidal representation of Mt. Meru is the Phimeanakas Temple, which stands at the now non-existent royal palace. Most of the decorative features of this temple have broken and disappeared but climbing the structure and seeing the views of other temples is possible for its visitors. 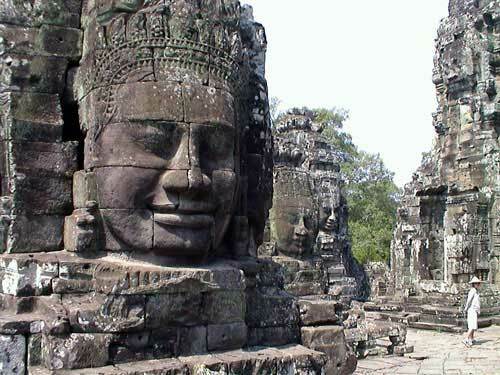 The temples found at Angkor Thom have some of the most interesting sights. Most of them are located near the center and are built relatively close to one another. It is an amazing sight to see such magnificent temples within a small area, making this a must-see destination when in Siem Reap.